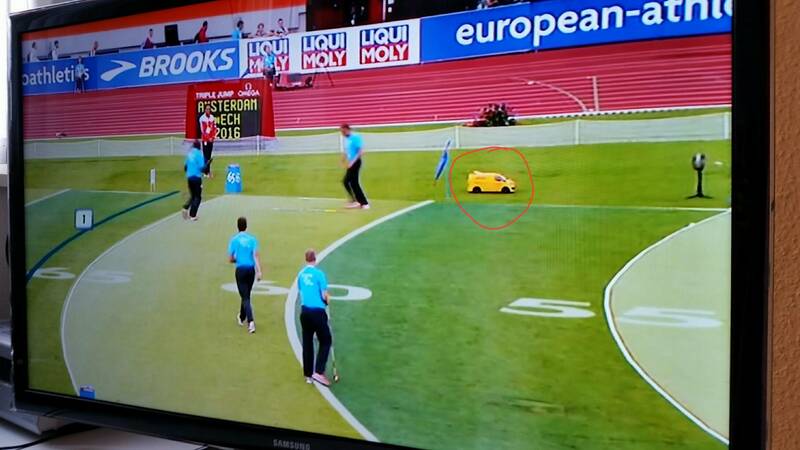 When they measure the distance of javelin throws during the European Athletics Championships in Amsterdam, there are small yellow remote controlled cars driving around. Here is a screenshot of them. What are the yellow cars used for? Over eight million TV viewers across Europe watched the remote control 1:5 scale model Volvo XC90 collect javelins, discuses and hammers for the athletes at the European Athletic Championships in Gothenburg last week. Note that the article linked above is reporting on the 2006 Gothenburg event, so this practise has obviously stood a test of time! Why not make the starting pistol predictable in running competitions?